After training with the MTU program, Peter Rotich is helping to boost his community's yields by providing conservation tillage services to local farmers. Peter Rotich is the kind of neighbor everyone needs. A farmer in the rural Rift Valley of Kenya, he opens his home to other farmers, and they swap tips and discuss the techniques they are trying this year to ensure a good harvest. Of course, it’s impossible to leave Peter’s farm without sitting down to enjoy a piece of fruit or a sandwich under a grove of shade trees. In addition to farming, Peter also provides mechanized services to the rest of the community, meaning other farmers hire him to till their land with his tractor. Mechanized service providers (MSPs) like Peter are not only essential for their communities’ yields, but could provide one of the many missing links disrupting the agricultural value chain in sub-Saharan Africa. In partnership with the John Deere Foundation, TechnoServe is implementing the Mobile Training Unit to provide farmers and MSPs like Peter the knowledge, skills and tools they need to improve not only their own livelihoods, but those of their neighbors across the region as well. 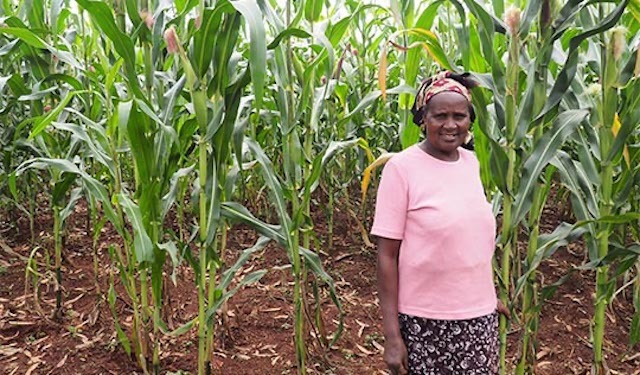 Maize and dairy farmer Veronica Musoti proudly displays her maize crop. She hired an MSP to till her land using conservation tillage techniques. Smallholder farmers are essential for agricultural production in sub-Saharan Africa, where most farmers work a hectare or two of land. These farmers form the backbone of the rural economy, but agriculture in the region has been characterized by a persistent gap between potential yields and what smallholders actually achieve on their farms. In fact, farmers in Africa are often 50 percent less productive than those in other emerging markets, like India. There are a number of reasons for the low yields found in Sub-Saharan Africa, such as poor training on good agricultural practices, limited access to high-quality inputs, and lack of mechanization and other yield-enhancing technologies. Ultimately, sub-optimal yields and unstable prices for their crops can keep farmers trapped in poverty. It is vitally important that the global community helps local farmers and businesses to address these challenges and close this gap. Today, Africa must import $35 billion of food each year to feed its population, and that figure is expected to rise to $110 billion by 2025. With half of the coming decades' global population growth forecasted to occur in Africa, demand for food in the region will only increase further. 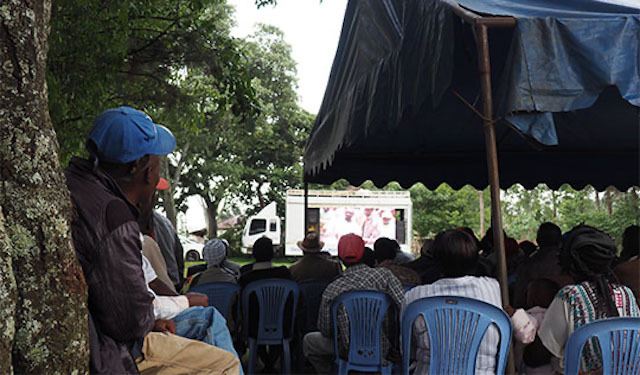 In order to build towards a more productive and food-secure future for African communities, TechnoServe and John Deere launched the Mobile Training Unit (MTU) project to help farmers in Ghana and Kenya. The project not only provides training through videos and hands-on demonstration, but also strengthens the organizations and linkages that farmers need to prosper and – increasingly – helps these farmers to enjoy the benefits of mechanization. Since 2014, the project has benefitted 47,194 people, helping them to earn an extra $29.9 million of income. The MTU project takes its name from the mobile training unit, a box truck modified to screen training videos. The MTU’s mobility makes it easy to reach widely dispersed, rural communities. There are a number of obstacles that keep farmers in Kenya, Ghana, and much of the rest of the region from enjoying the benefits of mechanized agriculture. Most smallholders lack the capital or access to financing that they need to buy their own tractors, and the business case for individual ownership is weak, despite the many potential benefits of mechanized services. Starting in 2016, with support from Deere & Company and the Deere Africa team, the MTU project began addressing the issues of limited access to mechanization in a systematic manner. Working with local stakeholders, the MTU project is encouraging a model for mechanization in which both demand and supply for the services is sustainable. Project staff identify existing tractor owners and entrepreneurial farmers like Peter who can become mechanized service providers, and trains them on agricultural techniques and the business skills required to run a small enterprise. To increase the supply of tractors, the project links MSPs to lenders who can finance equipment purchases. Although Peter had already harnessed his enterprising and community-oriented spirit into an MSP business, he hadn’t received specialized training on how to use the tractor. “We didn’t know that we were contributing to the low production for the farmers. Because one, we didn’t know that we have to calibrate the tractors, that there is a required depth when you plow. So when I rendered the service I might be doing it the wrong way. And the farmer also doesn’t know, he believes in me, that I’m doing the right thing,” he said. 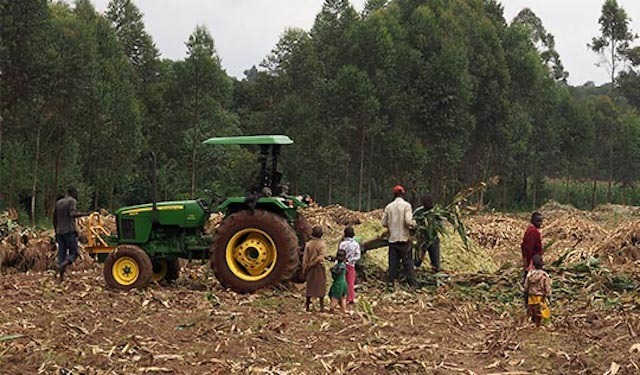 A mechanized service provider helps a farm to shred maize for fodder in western Kenya. Through the MTU project, he learned better plowing techniques, as well as the principles of conservation agriculture and minimum tillage, in which a chisel rather than a disc plough is used, conserving soil and water. Peter used a chisel on his own farm, and immediately saw the impact. “You can see the difference between the shambas (a local word for farm) that were chiseled versus tilled, because they’ve retained water. Also it prevents erosion, so the roots get the nutrients easily, the plant doesn’t struggle. More production means you get more profit - that’s where I pay my school fees from now,” he said. So far, 43 MSPs have been established or strengthened, and the project has helped to facilitate the sale of 48 tractors. In Kenya, 13 MSPs supported by the project have provided mechanization services to farmers on 1,585 acres, earning an additional $24,000 of income. Read how another MTU participant in Ghana utilized his training to begin plowing for profits.